Access 2016 provides a handy field type specifically designed for dealing with the special data that are hyperlinks. As you probably guessed, this type is called the Hyperlink field. Adding a Hyperlink field to a table doesn’t require special steps. Just use the same steps for adding any field to a table — get to Design view for your table and use the Data Type column to choose the Hyperlink data type. The Hyperlink data type is no different from the other field types in terms of applying it. When you hop back to Datasheet view, you’ll see that your entries (if any) in the Hyperlink field are underlined, looking just like link text on a web page. 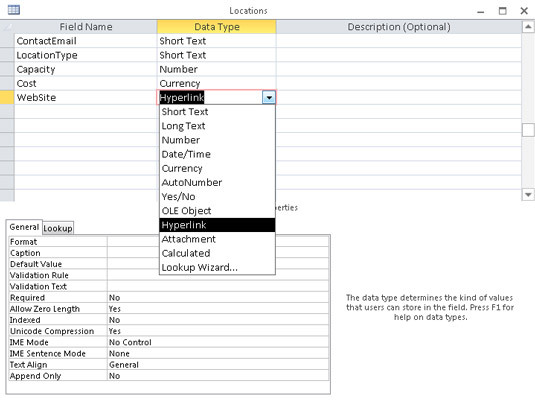 In Design view, choose Hyperlink from the list of data types. Right-click the hyperlink field you want to change in your table. 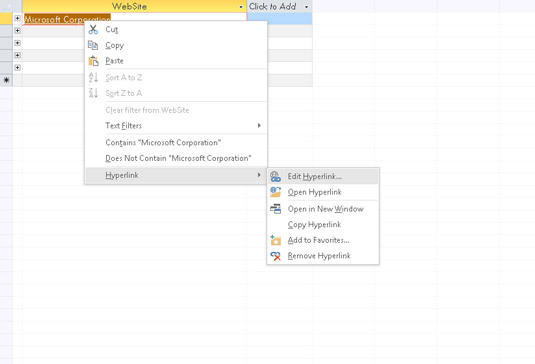 Choose Hyperlink and then select Edit Hyperlink from the pop-up menu. 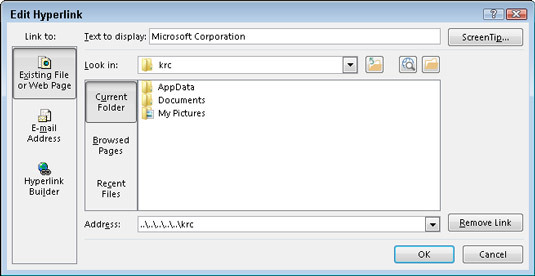 Right-click a stored hyperlink within the table and access tools for editing it. This nifty little dialog box appears. The Edit Hyperlink dialog box. The ScreenTip (the little text that pops up when your mouse pointer hovers over a web address). To create one, click the ScreenTip button and use the resulting Set Hyperlink ScreenTip dialog box to create your tip — then click OK to return to the Edit Hyperlink dialog box. Links for documents, spreadsheets, graphics, or even email addresses in an Access database. Your hyperlink is edited, showing the text you choose to display and pointing to the web address (document or other file) that you designate. If you choose to create a ScreenTip, you can test the new tip in Datasheet view by mousing over your hyperlink and seeing what appears. Pretty neat, huh? Experiment with the dialog box a little to find out how everything works. It takes only a moment. Although most hyperlinks store web or other Internet addresses, they can point to just about anything in the cyberworld. Thanks to their flexible tags, hyperlinks understand web pages, intranet servers, database objects (reports, forms, and such), and even documents on your computer or another networked PC.